It was a broken up week but there were some noteworthy events. The Fed minutes didn’t tell us anything new but there was some jobs data and the implementation of tariffs. none of these seemed to move the markets. This week we discuss some oversold markets, the precious metals and get another interesting company update regarding an ongoing takeover offer. I hope everyone has a great weekend! I love hearing from all of you so please email me at Fleck@kereport.com with any company recommendations and topics of interest. Segment 1: Jordan Roy-Byrne, Founder of The Daily Gold kicks off the show with a look at the precious metals. We address how the stocks moved this week and comment on the gold:silver ratio. Segment 2: Anaconda Mining had a busy week. The Company increased its offer to Maritime shareholders but included a contingency and released drill results from Goldboro. Dustin Angelo joins me to outline the finer details. Segment 3: Chris Martenson, Co-Founder of Peak Prosperity, says fundamental analysis does not work anymore thanks to central banks. Segment 4: We wrap up the first hour with Raghee Horner, Futures and Currency expert at Simpler Trading shares her thoughts on a couple markets that are attractive investments. Thanks as always fella’s for your efforts in putting the weekend show together. Agreed. Thanks Cory & Big and all the KER contributors. Jim Willie on gold and oil, etc. Thanks CFS, you just blew my mind. Al had better listen to this. 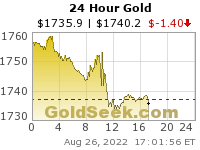 Thanks for the gold chart update. The log scale scenario is quite interesting. Next week truly will be key. I have to confess that I have no worries about next week. Everything looks “right” even though not perfect. That’s great. I am more than ready for this correction to be over. Looks like a reversal in gold off that SMA envelope support band from this weeks action. It may be that the low Daily Sentiment Index reading near 10 in Gold and oversold conditions on the oscillators, coupled with the Full Moon event, and the Trade War jitters allowed Gold to put in a short-term bottom for a little rally. We’re in for a rally but I doubt that it will be little. This low looks like a significant one to me, not short term. Of course he could be right but his scenario doesn’t look likely to me. I tend to agree with you. A lot of people are looking lowerwhich seems like a perfect time to just keep going up for a while to make folks start chasing again. Good thoughts Matthew & Charles. Yeah, I’ll be looking to see if that $1310-$1312 resistance can be taken out on this rally, and if so it could be a much larger run. Still it will be a tradable rally nonetheless. Cheers! 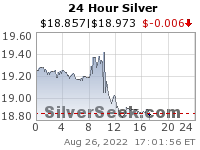 It might be another week before silver starts to outperform gold meaningfully. Thanks for the show and update from Anaconda. Recently I was on a rant on a different blog, disagreeing with those that feel the last 2 years was the continuation of the bear and that we are now 7 years into a bear. It is funny (and encouraging) to read the negative sentiment and erroneous claims that that move in 2016 as nothing more than a “dead cat bounce” or a “relief rally” in a bear maket, as those comments are wrong on many levels technically. First of all, a “dead cat bounce” or “relief rally” is when an equity is still in a cyclical bear market and bounces, but will resume the downtrend; and that is clearly NOT what happened in Gold as it never got anywhere close to the $1045.40 low from December 2015 in 2 & 1/2 years, and put in a series of “higher lows”. When Gold surged for the first 8 months of 2016 it took out a number of prior peaks & the 2013 spike down trough that really accelerated the bear market, and those hadn’t been cleared in years. That makes 2016 an “impulse leg” higher because it took out the most recent prior peaks, (actually Gold took out about 3 of them – bear market rallies don’t do that). Next up, Gold pricing surged up through a number of key prior moving averages (233, 144, 89) day EMAs, that it hadn’t surpassed in years. This was also true on the weekly charts. In addition, the EMAs reverted back to the shorter ones on top and the longer duration ones on the bottom, where in the bear market the shorter were on the bottom and the longer were on top. Those were 2 more key clues that the bear market had truly ended in the metal in Dec 2015. Relief rallies don’t do that. Lastly, 2016 broke down most of the normal seasonality trends in an outside year where the metals continued rallying through the PDAC curse in March, and then powering through the remainder of Spring and into the Summer Doldrums to new highs. It was very unusual and strong action. Gold got too far ahead of itself and corrected back down during late Aug – Oct (a time that is typically a strong seasonal period for Gold). That move up for the 8 months into August showed how strong the energy being released was and was yet another tell that this was not just a fluke or a relief rally, so the consolidation since then makes sense to digest those gains. Pundits that are now dismissing the move up in 2016 as some kind of novelty, or just a nice little bounce don’t seem to understand the gravity of that move up, the overhead resistance that was sliced through like a hot knife through butter, and how that definitively ended the bear market once and for good. Gold has been in a new bull market since the tail end of Dec 2015 and has been making higher lows ever since. It is nowhere close to $1045.50, and took out the 2017 high this year. Unless Gold takes out $1238 to the downside then even that trend upwards of higher lows has not been negated either. If we were still in a 7 year bear market then Gold would have pierced it’s bear market low of $1045.40 back in 2016, or 2017, or even in 2018. It’s nowhere close, so people need to put things in perspective. Investors that positioned in late 2015 & early 2016 really set up the last 2+ years well, and are still sitting on gains if they were buy and hold;… but old turkeys get run over in the commodities space, and it is much better to trade the rallies and trim some profits when they are in favor. #Gold added $200-$300 (from the $1045.40 bear low) for most of the last 2 1/2 years, which provided plenty of opportunities for gains, and that wasn’t continuation of the bear by any stretch. Even if investors missed the initial 2016 impulse leg up that ended the bear market, there were still a number of other tradable rallies on the Gold roller-coaster, (Q1 Run in 2017; Aug-September seasonal rally in 2017; Q1 run coming off the Dec 2017 FOMC rate hike). Bears conveniently forget to mention those tradable rallies acting like all was despair the last few years. (it wasn’t) They like to measure from the 2016 peak in every example, acting like that is where everyone got positioned. It is interesting how that argument gets destroyed when you measure Gold or many miners from the Major low that ended the bear market in Dec 2015 (which was the most significant point to analyze the bull market that has followed since). There was plenty of time, and plenty of volume in the metals and miners showing investors got positioned long before Aug 2016, and have continued to trade in and out of the market since then. Some did great, some have a wash, and some lost — That’s what makes a market though. Over the last 2+ years, many #explorers still had periods where they surged on good news & market speculation, #developers or companies in production with the right assets were #takeover success stories at a premium for nice % gains, and companies improving their #production gradually climbed higher as they were rerated. Investors love to cry low and buy high…. some things never change. Has to do with the collapse in the value of most assets as U.S. and global oil production plummets. Gold 6 month Low in place? (KNT) K92 Mining looks set to really break out in the medium term. They’ve done a great job of expanding their resource through the drill bit, hit the new Kora zone which greatly improved their economics, they are profitable at production now, and they just raised money with out of the money warrants (showing the confidence in their project that investors have). They really have turned their operations around over the last year, and are finally starting to get re-rated for a job well done, but there is still plenty of room to run in this one over the next few years. K92 is well financed, has a strong balance sheet, and mining and processing operations are now cash-flow positive. As announced on June 26, 2018, K92 prepared an updated resource estimate on Kora North based on results from underground grade control and exploration diamond drilling, and face sampling. The updated resource estimate comprises a measured resource of 242,900 tonnes at 13.9 grams per tonne gold, 19 g/t silver and 1.0 percent copper; an indicated resource of 442,800 tonnes at 11.8 g/t Au, 21 g/t Ag and 1.2 percent Cu; and an inferred resources of 1,084,400 tonnes at 13.2 g/t Au, 15 g/t Ag and 1.0 percent Cu. Note the inferred resource concentrations! Agreed. Only contrarians make the big gains. “The expected decline from the potential bull market 92-96 index buy signal at USERX 7.59 has yielded supportive 16-20 index and 35-39 index signals each time that USERX has dropped to 7.51. Historically, the new 35-39 index signal can mark an exact low OR it can yield an intermediate-term bottoming process that can persist up to 35-39 trading days before the 35-39 index re-buys for a likely impulsive rise. The master 92-96 index’s back prices will take about 2 months to rise to the current price area, so if the 35-39 index does not re-buy during the normal 35-39 day time period, the bears will get the 92-96 index’s sell signal. Looks like my NSU shares will continue to drift lower. Nice pop on ISVLF this morning on above average volume.